Asbestos is a highly dangerous material, and during the years when it was used as a construction material, asbestos exposure was common. 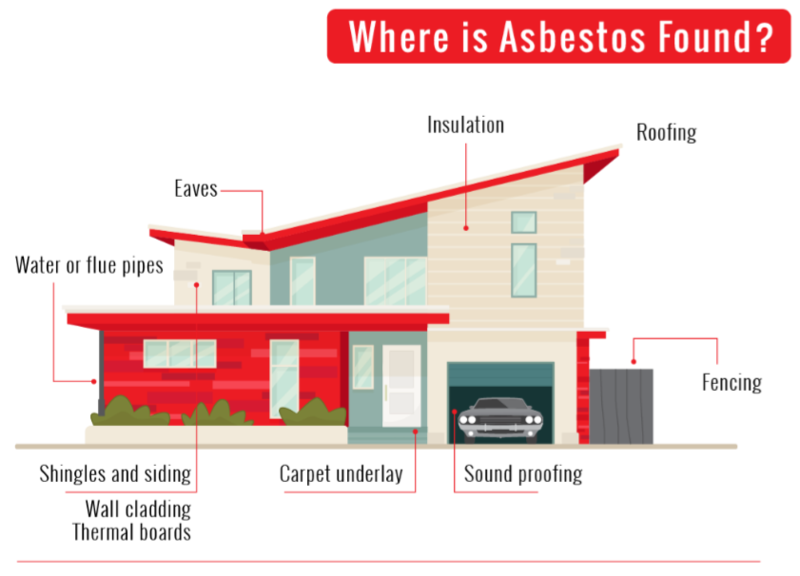 Found in all manner of pre-1990 construction materials, as well as the manufacture of car parts and more, asbestos is banned in Australia, but many items containing the material remain, so it’s important to know what to do. Asbestos testing is the best way to check whether any of it is still present in your home, and avoiding the import of items from countries that still use it is also key. Why is asbestos so dangerous? Put simply, all forms of asbestos are carcinogenic, which means exposure can cause cancer. A report by the WHO (World Health Organisation) stated that around half of all workplace-related deaths around the world are due to exposure to asbestos. You may be wondering what the danger of asbestos is. Most people who breathe it in will feel fine afterwards, and may not fall ill until decades later, so getting medical advice quickly is important. There are a number of medical conditions related to asbestos, but the one you’ve most likely heard about it mesothelioma. Since the 1980s, around 10,000 Australians have died from mesothelioma, as well as lung, ovary, and larynx cancers caused by asbestos fibres. Many people who worked with asbestos also went on to suffer from asbestosis. This disease is caused by the accidental inhalation of asbestos fibres, which then scar the lungs and inhibit breathing. This disease generally develops around 20 years after exposure, although the symptoms such as shortness of breath and chest tightness, can appear between 10 and 40 years after inhalation. It’s not just your own health that can be put in danger by asbestos. Since even a small fibre can cause danger, there have been causes of the children of asbestos workers becoming ill from secondary exposure. This could be due to small fibres getting stuck to their parent’s work clothes, leading to the same conditions as detailed above. If you are planning to do any work to an Australian building built before 1990, then an asbestos inspection is key. Whether it’s a business or residential structure, even small jobs such as drilling into a wall can disturb asbestos, so if an inspection hasn’t been carried out, get the professionals to do a check. If asbestos is found, they can advise on the best course of action. Those who work in trades such as plumbing and carpentry are most at risk of asbestos exposure. Before starting a job on an older property, speak to the site manager or homeowner to find out if they’ve had an asbestos inspection carried out. If you suspect that you might be put at risk, contact Safe Work Australia for advice. The most important thing you should do if exposed to asbestos is to get medical help as soon as possible. Your doctor will most likely refer you to someone specialising in asbestos-related diseases, and Medicare usually covers the cost of these appointments. Even if you suspect you may have been exposed to asbestos, perhaps at an old workplace, you should ask your doctor for advice. Remember, many asbestos related illnesses take decades to develop, so even if you were exposed a long time ago, you should still have regular check-ups and look out for any symptoms. If you are unlucky enough to contract an asbestos-related illness, then early detection is key to give you the best possible outcome. If you find asbestos in your home or workplace, then make sure nobody else can access the area. Seal off and stay away from the area until a professional can assess it, and put up lots of signs so nobody accidentally wanders into the area. If possible, add an additional lock. If asbestos is suspected, then the only way to tackle it is by hiring licenced professionals. They can inspect the property, and identify areas where asbestos is present. The experts will know which areas of your building is most likely to have asbestos, so know where to look. If they confirm the presence of asbestos, then they’ll be able to offer solutions about the best way to get it removed. While we already know about the links of smoking to cancer, some people are unaware that smoking has been linked to mesothelioma. Those who’ve been exposed to asbestos, and who continue to smoke, are at the highest risk, so get motivated to quit. Generally looking after yourself with a healthy diet and exercise can lower your risk of cancer in general, although it can’t undo the effects of asbestos exposure completely. You should also make sure your vaccinations are up to date. Ensure you get flu and pneumonia vaccinations yearly, as coming down with either of these illnesses is particularly dangerous for those who’ve been exposed to asbestos in the past. While exposure to asbestos doesn’t necessarily mean you’ll suffer from a health condition, it’s very important for those exposed to asbestos to get check-ups for the rest of their lives. They should remind their doctor annually of their exposure, and ensure they get pulmonary testing to see how their lungs are functioning. Once exposed to asbestos, there’s no antidote, but by taking care of your health and being on the lookout for the symptoms of asbestos-related illnesses, you can ensure that should you fall ill, you can get diagnosed more quickly, with early treatment giving you the best chance of recovery.